Gnashes added a comment to T122252: Misplaced Stop Sign - Altis. Another year, another rabbit told to stop before reaching the road. Confirmed to have survived 2018 as well. Gnashes added a comment to T128135: Infostand (2-leg) - Hard to interact. Most notably, from a 3rd person perspective if your cursor is on the flat portion of the stand the addAction applied to the stand will not display. However, if you place your cursor between the legs of the stand, the addAction will display. Gnashes created T128167: Offroad (HMG) Gunner 3rd person camera misplaced. Gnashes added a comment to T127160: Ghillie suit armor bug. Gnashes added a comment to T124802: Mass Battle Eye Kicks on Multiplayer servers..
@Neology Haha, feel free. I largely just stopped answering our community and began directing them to this ticket. Gnashes added a comment to T127136: Ability to export box inventory the same way we can export player loadouts; Also the ability to type in numbers for quantities instead of clicking on plus or minus.. Here's an existing way to do it. Gnashes edited Steps To Reproduce on T126799: Modifying a Global Variable can impact other Global Variables. Gnashes created T126799: Modifying a Global Variable can impact other Global Variables. Gnashes added a comment to T125565: [Request] getPlayerGUID / getPlayerIP Scripting Commands. @dedmen I'm specifically looking for a client command that returns the calculated GUID and not the Steam PlayerID. Gnashes added a comment to T126491: wrong japanese translation on the laser battery. At a glance, it looks like "レーザー指定子" may be a better fit? Gnashes created T126477: Some House hitboxes result in incredibly high damage..
Gnashes updated the task description for T126354: [Request] pullBack . Gnashes created T126354: [Request] pullBack . Gnashes created T126277: difficultyOption returns 0 for all RTD difficulty options. Specific uses would be for something such as a function to add experience (fn_addXP). If malicious players utilizing some BE bypass method were executing this to script-inject themselves experience. Gnashes updated the task description for T125565: [Request] getPlayerGUID / getPlayerIP Scripting Commands. Gnashes edited Steps To Reproduce on T125992: 1.72 say3D / Description.ext maxDistance Default. Gnashes created T125992: 1.72 say3D / Description.ext maxDistance Default. Gnashes added a comment to T125983: Arma 3 crashing, reporting "out of memory, requested 4096kb". Something worth noting, if you're using a 32bit OS, I'm assuming you're also using a 32bit version of Arma 3. No 32bit executable can actually use 16GB of RAM. @Wilco Asylum is keeping an eye on this. Seems based on our internal experiments that a hard restart alleviates the issue, but if left unchecked the server will continue to kick every time it fills back up (every 15 mins or so) until it naturally hard restarts. Gnashes created T125565: [Request] getPlayerGUID / getPlayerIP Scripting Commands. Gnashes added a comment to T117103: Player Naked. Gnashes updated subscribers of T124988: Cannot create Debug Console. Gnashes updated subscribers of T124933: Most Jet OP against groundtargets after update - Useless "bubblegun" AA-tanks. .
Gnashes added a comment to T124215: MASSIV OP JETS against ground, especially Anti-Air-Tanks. I'm pretty sure in the history of warfare, air superiority has, and will continue to be, a vastly superior option to ground-based forces. Gnashes added a comment to T124835: Debug Console Security Changes. Gaming-Asylum started having the issue in May/June (more heavily in June). Here's a post from one server experiencing the issue that has a touch of detail. Gnashes added a comment to T124456: (vehicle player == "Steerable_Parachute_F") returns generic error. Also worth noting that (vehicle player isEqualTo "Steerable_Parachute_F") returns false when in a steerable parachute. Gnashes created T124456: (vehicle player == "Steerable_Parachute_F") returns generic error. Gnashes added a comment to T124320: No longer able to launch Arma3_x64.exe from batch file. Gnashes added a comment to T124086: Weapon Deployment may hide character model under terrain. Ahh. Well then, my mistake. Gnashes created T124086: Weapon Deployment may hide character model under terrain. Gnashes added a comment to T123908: Player Disconnect issue. Gnashes added a comment to T123897: Land_Offices_01_V1_F - No longer found as Building or revealing under CursorTarget. Gnashes created T123806: simpleObject true state disables animations for buildings. Gnashes added a comment to T123803: game and server update mismatch. Servers owners have to update their own servers. Alternatively, you can roll back to the previous version on Steam by using code "Arma3Legacy166" in the Betas tab. Gnashes added a comment to T59444: Snakes can open doors. Gnashes added a comment to T123348: Quoted text in unbinerized mission description is cut off.. I'm pretty sure non-binarized files have to have all instances of double quotes encased in double quotes. Gnashes added a comment to T120992: Apex Ownership affects Hatchback Sport sand behavior. Gnashes created T122252: Misplaced Stop Sign - Altis. Gnashes created T120992: Apex Ownership affects Hatchback Sport sand behavior. 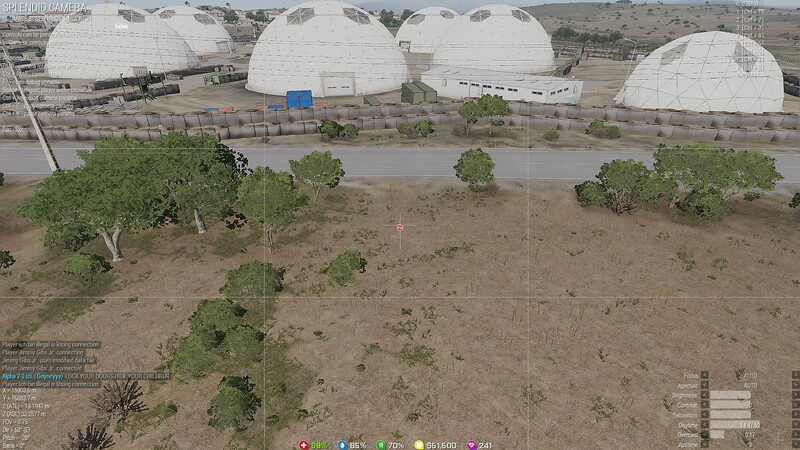 Gnashes added a watcher for Arma 3: Gnashes.